Tower 4, 8th Floor!! Free Beach Service Seasonal!! Book Now To Secure Your Dates!! FREE BEACH CHAIRS/UMBRELLA COME WITH THIS UNIT!!! Spend your vacation in comfort and style at Long Beach Resort. Located on the 8th floor of Tower 4, this condo has so much to offer. This tastefully decorated 750 sq ft condo is just the place for you to get away and relax. All new stainless steel appliances for the kitchen and new bedroom furniture for the master with a new premium upgraded mattress and new living room sofa and loveseat.. The spacious balcony is your own private beachside oasis where you can enjoy your morning coffee, or end the day with a nice glass of chardonnay. Access the balcony from your bedroom or living room. Both rooms have floor to ceiling windows for fabulous views of the Gulf and full black out curtains for when you wish to sleep in. The condo accomodates 4 persons with a king bed in the master and a queen sleeper in the living room. 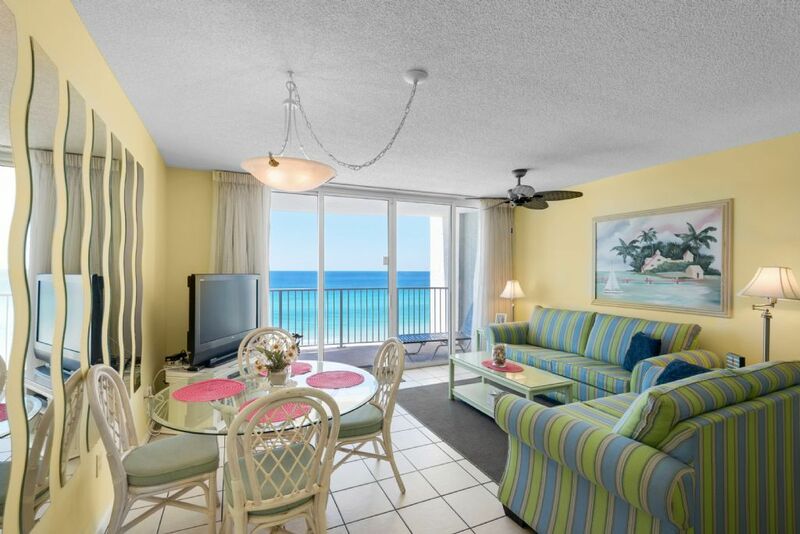 We know you don't come to the beach to cook, but should you choose to dine in, the kitchen is well equipped and the condo seats four at the dining table and 3 at the breakfast bar. Long Beach Resort sits directly on the Gulf of Mexico's sugar white sandy beaches. The resort features 2 Polynesian pools (seasonally heated), 3 Jacuzzi spas, and a 6800 square foot lagoon pool complete with palm tree islands, waterfalls & lush tropical landscaping. Long Beach Resort has security 24 hours a day, 7 days a week. Parking is directly in front of your building -- not across the street --not in a high-rise tight-spaced parking garage! Beach Service offers rentals for chairs and umbrellas, jet skis, para-sailing, etc., weather permitting. Super-Wal-Mart, restaurants, shopping, and Ripley's Believe It or Not are within walking distance. Golf, mini-golf, Shipwreck Waterpark, Pier Park outdoor mall, and theaters, are just a short drive away. This condo provides free wifi access and free local/long distance calls to the US and Canada. This a NON-SMOKING Condo, PETS are NOT allowed, and RENTER must be 25 years of age or older. THIS UNIT ALSO INCLUDES FREE BEACH CHAIRS!!!! NO CARRYING CHAIRS TO THE BEACH EVERY DAY, THIS FREE SET INCLUDES 2 CHAIRS WITH CUSHIONS AND 1 UMBRELLA, SET UP FOR YOU DAILY!! Fair. Thought condo needed some updatess ! Starting with the bedding! We really enjoyed our stay this week . The condo is beautifully decorated, and we had everything we needed. Love the direct beach double and private balcony . Bed was comfortable . The 2 beach chairs and umbrella that came with it was a real plus too . Pool areas are great ! Nothing negative to say. Will definitely stay again when we come back to the beach . Nice clean condo with great view and easy beach access. Pool and pool bar are great as well. Nice condo very clean. Wonderful views of the beach. Very close to attractions and my favorite resturant Firefly. We will use Kim's Condos again. Thank you for a relaxing vacat. The view alone makes it worth it! This condo was amazing! The view is absolutely stunning!! The bed was huge and comfy.We loved the style of the bathroom where someone could shower and someone could also be getting ready. We loved having a washer and dryer as well. The resort had a beautiful pool and easy access to the beach. We got the free beach chairs and that made beach days much more comfortable. The staff that worked on the beach were very nice as well. We would definitely stay here again! ADD 13.1% tax, $75 cleaning fee, $39 accidental damage insurance and $4 per car parking (1 car max). Holidays and Special Events may have higher rates than what is posted.